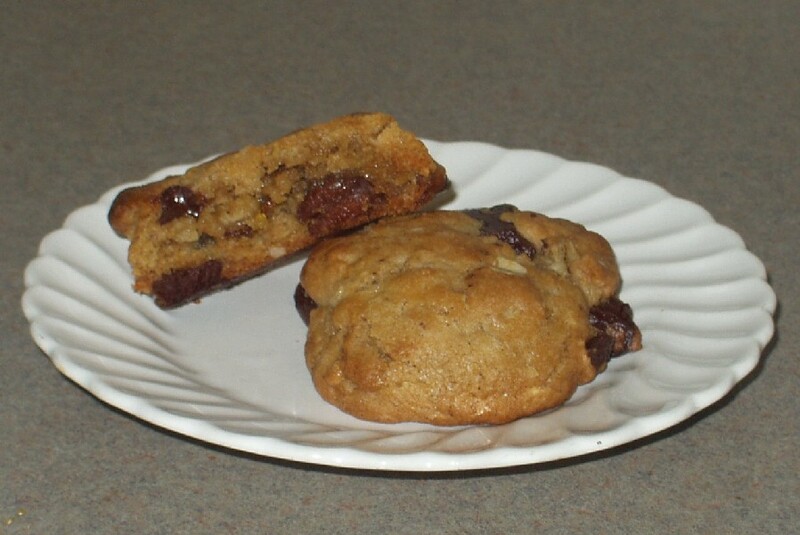 Pecan Pie Chocolate Chunk Cookies are chocolate chunk cookies with little chunks of pecan pie throughout. You don’t have to buy a whole frozen pie for this recipe. Edwards and Mrs. Smith’s sell their pies in convenient “singles” packages which give you two individually boxed slices. However, in my opinion this is a recipe that’s best for when you have a few slices of pecan pie that you want to use up. Cut frozen or pecan pie into bite size pieces and place in freezer until frozen or, if using already frozen, until ready to use. In a medium bowl, stir together melted butter, sugar and dark brown sugar. Add egg and vanilla. Stir until smooth. salt. Stir into sugar mixture. Fold in frozen pecan pie pieces and chocolate chunks. Using a quarter cup measure, scoop and shape dough into balls and place on a dish. Chill shaped dough balls for at least 1 hour or until ready to bake. Preheat oven to 375 degrees F. Place thoroughly chilled dough balls about 3 inches apart on an ungreased non-stick or parchment lined cookie sheet. first 10 minutes to prevent over browning. Cool on cookie sheet for 3 minutes, then remove. And that is what I based this one on. The oats in the other version are definitely supposed to be there, but you hardly notice them in the end. Krista, I have a bunch of other “piedeas” that used pecan pie, so I’ll post them too. Another one was a Magic Cookie Pie, where you pour a thin layer of condensed milk over a frozen pecan pie, sprinkle a mixture of chocolate chips, pecans and coconut (or broken cookies) over the condensed milk and then bake it. I’ll try to post that a few other ones today. Damon loves pecan pie. He’s out of town for his side gig but I think I will make these as a “welcome home” treat. I’m always amazed with your creations! Thanks, Sylvie! We liked the cookies too, but I guess the judges were looking for something else this time. I can’t wait to see who the winners are.Have fun on your trip. This recipe sounds and looks quite good. How creative!